"Hi. Do you know me? I'm currently in eighth-place in the Winston Cup standings. I've won one race this season, had four other top-5 finishes in the season's first 15 races. I'm one of the most consistent racers on the tour this year, even though not too many people expected me to be this high in the standings. Still, not many people know who I am. That's why I carry the American Express card ..."
Steve Park may not need to make an American Express commercial to get recognition -- his driving is doing that for him this season -- but there's no question Park has been one of the most pleasant surprises of the first half of the season. 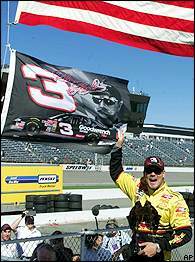 Steve Park dedicated his win at Rockingham to Dale Earnhardt. "We call our team the underdog because nobody ever picks us to win, and nobody ever picks us to run good," said Park, driver of the No. 1 Chevrolet, one of three teams owned by Dale Earnhardt Inc. "Then, all of a sudden we do, and it seems to be a surprise to others week after week. It's not a surprise to us, but it just seems to be a surprise to everybody else. So, labeling us as the best-kept secret in NASCAR is pretty much a great way of putting it. "For example, we finished second at Dover and didn't get one bit of press. It was all about how dominant Jeff Gordon was. But who the hell finished second? Maybe being labeled an underdog is a blessing in disguise." There's no disguising Park's performance in 2001, however. The 33-year-old East Northport, N.Y., native has not only been one of the circuit's biggest surprises, he's also been the guiding light for DEI since team founder Dale Earnhardt died in the season-opening Daytona 500. Park has consistently been in the top-10 since winning at Rockingham, N.C., one week after Earnhardt's death. His performance has continued to outshine that of teammates Dale Earnhardt Jr. (11th) and Daytona 500 winner Michael Waltrip, who has struggled miserably since the season-opener. "We've had a pretty good start, although we're in a little bit of a slump right now," Park said. "NASCAR kind of threw us a curve ball and gave us a rule change and took some of the bump stops away that we had done of our most testing at the beginning of the year. Right now, we're trying to rebound from that a little bit, but the team's been doing an excellent job. "We've got three second-place finishes (Darlington, Texas and Dover), which easily could have been four wins. The team's performance has been where we need to be. We kind of struggled at Michigan and got involved in a wreck at Pocono, so we're looking forward to going out to Sonoma, rebound a little bit and try to get another solid top-5 finish." This weekend's event at Sears Point Raceway in Sonoma, Calif., could be just what the doctor ordered for Park's mini-slump. His first career Winston Cup victory came on a road course last year at Watkins Glen, N.Y., and while he's struggled the last two years at Sears Point, Park is expecting a much better outing Sunday. He's even bringing a secret weapon with him: he'll be driving the same car he used at Watkins Glen last year. "I'm excited about this weekend," Park said. "We haven't had a real good finish at Sonoma. I've only been there twice. Last year, we ran in the top-10 and thought we had a real good race car, but had a mechanical failure that put us behind a little bit. Sonoma would be a great place to get back on track for this Pennzoil team." It couldn't come at a better time, as this weekend marks the last race before the last off weekend this season. After being idle next week, the tour begins a grueling marathon of 20 straight race weekends. There will be no more off-weekends until after the season concludes Nov. 18 in Atlanta. Compounding the situation is that, along with Sears Point, the next seven races could be the toughest stretch of the season, with a variety of track types -- road courses at Sonoma and Watkins Glen, a new venue in Chicago, a flat mile oval at New Hampshire and superspeedways (second stops at Daytona and Pocono, along with the annual visit to Indianapolis). What teams do in that seven-race stretch could likely set the tone for the remainder of the season ... and likely establish who will be the true contenders for the championship. And that's exactly where Park, crew chief Paul Andrews and the rest of the No.1 team want to be. "I think it's definitely the hardest stretch of the season," Park said. "I think it's going to set the tone to go into the second half of the season. "This weekend, we're making our second trip out to the West Coast, and then we go bouncing around all over, from the Southeast to the Midwest to the Northeast. It's going to be a tough stretch for all of us, but I still think these next five to seven races are definitely going to set the tone for the second half of the season." When Earnhardt died, observers felt DEI would be thrown into turmoil and become lost without its leader. There was even talk about Park, Earnhardt Jr. and Waltrip skipping the race at Rockingham. But after extensive discussion, all three teams agreed to carry on, with Park providing one of the most inspiring moments of this season when he not only dedicated his performance going into Rockingham to Earnhardt, but came away with his second career win.